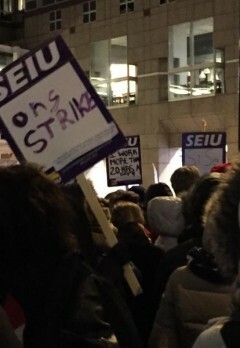 SEIU Local 26 janitors stage one-day strike | Fight Back! Minneapolis, MN - Hundreds of workers, members of SEIU Local 26, rallied Feb. 17, as janitors walked off the job in a 24-hour unfair labor practices strike. The janitors clean the skyscrapers in downtown Minneapolis and Saint Paul and office buildings throughout the suburbs. The strike comes after months of negotiations in which management companies have refused to budge on key issues for the union. The company wage offer is only 20 additional cents an hour and management is only offering to create part-time jobs. The union is pushing for a $15 minimum for all janitors and full-time work with livable wages.